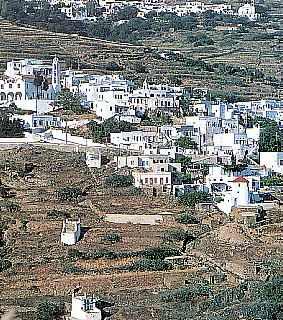 Panormos is the prettiest village of Tinos and had been its capital for many years. It lies 30 km north-west of Tinos, in a verdant area full of vineyards. It consists of the mainland settlement of Pirgos and the seaside settlement of Panormos. Pirgos is the birthplace of many great Greek artists, such as Nikiforos Lytras, Yannoulis Halepas, whose house has been converted into an art museum, Dimitris Filippotis and the composer Nikos Skalkotas. Their work is in incorporated into the famed School of Arts in Pirgos. At the centre of the village, there is the main square with a perennial plane tree and a fountain from 1778. Its picturesque houses with their pretty gardens and marble fronts are of typical Cycladic architecture. Among them, one can admire quaint little churches such as Agia Eleoussa, Agios Dimitrios, Agios Nicholas and the Presentation of Virgin Mary. While Pirgos is the place for sightseeing and relaxing, Panormos Bay will offer a wide range of activities. Panormos is only two miles away from Pirgos, and it's the so called "summer place" for natives. Many locals that live in Pirgos, own a small summer house in Panormos. Through Panormos, you will have access to four different beaches and numerous places for fishing.